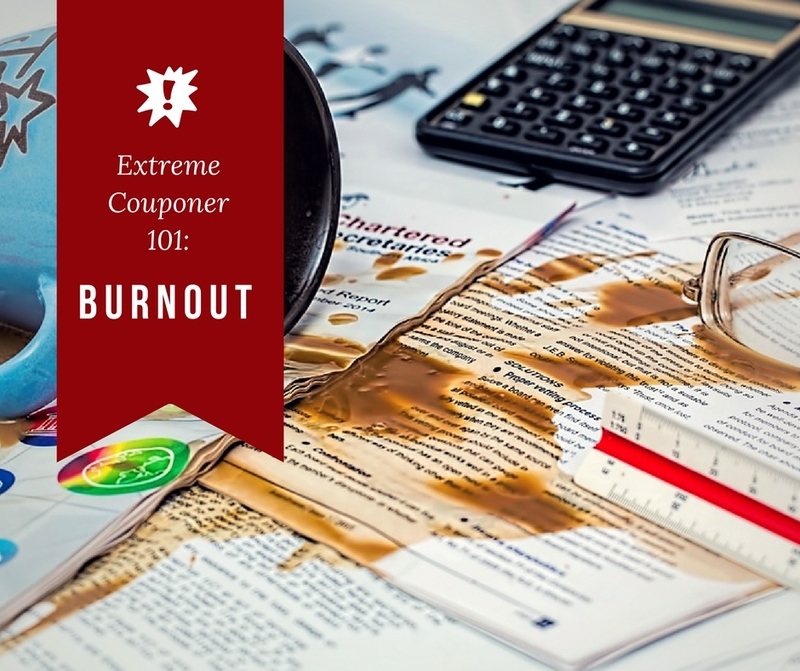 Have you ever struggled from coupon burnout? You may feel like you are stuck in a rut or confined to only buying items that have coupons. We can sometimes get too involved with only couponing and saving money, we consider it a good addiction but really we can be setting ourselves up for exhaustion. Do any of these sound like you?? 1. The last time you bought something not on sale was over 2 weeks ago. 2. You are craving a favorite food, but won’t get it because there is no good deal on it. 3. You are spending every free minute scouring the web for deals. 4. You make frequent trips to the store just to grab the latest free find. If one of those struck home, you are not alone. Most of us get very wrapped up in saving money. There are limits though and we can’t be super savers on every trip. To help you recover from burnout or to help you stay focused on the point here are a few tips. 1. It’s okay to spend money on the things you need. Really. If you have to repeat that to yourself every time you head into a store, then make it your mantra. Buy things if you need them. Try to work in your family’s requests. If you don’t, its possible that this will ultimately lead to frustration. 2. Work in some room in your budget for a splurge. If you are going into the store and saving 60% on your groceries then you probably can handle that $3 splurge item. Yes, it has no coupon and is not on sale, but that little splurge is really helping you stay grounded. If you never splurge then you will grow resentful of the coupons and the sales. 3. Remember most of your savings come from the sale price, not the coupon. Yes, you read that right. When I go in and get a $5 box of cereal for $1, over 60% off the savings was because I bought the item at it’s lowest price, NOT because I used a coupon. If you are ready to give up on coupons, then do it. Take a break from cutting, sorting, and gathering. This week instead of gathering coupons you could just make a shopping list from the items on sale. Skip the coupons and you will still save over 50%. 4. Limit your internet time. Spending 4 hours surfing for the best deals seems fun in the beginning but eventually it is not worth your time. In the end you will either be exhausted and overwhelmed by the things that aren’t getting done around you, or you will go crazy feeling like you need to get every possible deal at the store. 5. It’s okay to miss a deal. If someone finds a crazy deal on detergent for 25 cents but you have 5 bottles, do you really need to run out for it?? Remember that all sales run on cycles. If pickles are 9 cents at the store this week, it’s not the last time pickles are ever going to go on sale. Making a daily trip to the store to get the latest reported deal isn’t really saving you time or money. Grab the deals you know about when you are out and only go back for the latest find if you were headed there anyway. 6. It’s okay to only shop at one grocery store. Everything comes on sale at every store. Stock up, then there is no need to feel like you have to hit 4 different stores in the same week. If you wait a few more weeks, those items will come on sale at the store that you frequent the most. 7. Set a goal. In the end, stay focused on why you are couponing. Is it out of a basic need to feed your family or to save for something? Does it relieve stress to have money left over at the end of the month? Whatever your answer, realize that no one saves money just to say they did it. Don’t focus on the number at the bottom of the receipt but focus on whether you are accomplishing your purpose for saving. As long as you are meeting your goal it doesn’t matter whether you are saving 60% or 45%. Our story: We got started couponing out of a need to pay off a large bill. Now that we have covered that expense we coupon to put money in savings each month. Our weekly grocery budget is small, but it still has a lot of wiggle room for things we like. To help me not get fatigued with coupons, any extra money in the food budget at the end of the month, is not put into savings. Instead that extra food money is put back into groceries getting things that we love but that aren’t on sale.